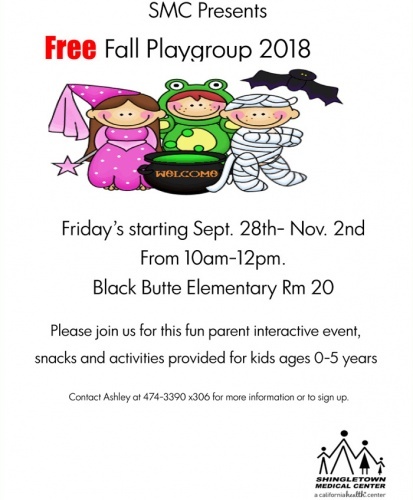 The Shingletown Medical Center is offering a free Fall Playgroup on Fridays from 10:00 am to 12:00 pm at Black Butte Elementary School Room 20 for kids aged 0 to 5 years old starting Friday September 28 and ending November 2, 2018 This fun parent interactive event includes snacks and activites. Ashley at (530) 474-3390 x 306.
please contact Ashley at (530) 474-3390 x306. Note: In addition to providing medical services, the Shingletown Medical Center also has a Fitness Center, a Shingletown Area Resource Center, and provides Community Programs, Classes, Playgroups, Mental Health Services and an Emergency Food and Outreach Center.